Shipping: NO ETA. Contact me for availabilaty. 3.875" Long Lug MFI HK G28 DMR Style Muzzle Brake / Barrel Extension for Ca. Compliant: FNH / FN FS-2000 or any weapon with 9/16 X 24 tpi Left Hand Thread to get to Ca OAL 30" or MD OAL 29" or a Featureless Ca. Semiautomatic Rifle. This Version of the MFI HK G28 Muzzle Brake is specifically made for the California and Maryland Markets to meet the California DOJ & MD minimum overall length of 30" or 29" for the New FNH FS 2000 / FN FS-2000. This item will fit ANY BARREL with a 9/16 X 24 LEFT HAND Thread. 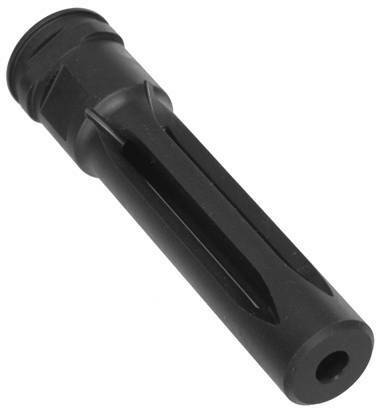 This item fits any weapon with a 9/16 X 24 threads WITHOUT ANY MODIFICATION. You do however need to remove the existing Flash Suppressor / Flash Hider / Muzzle Device. Shipping Remarks: NO ETA. Contact me for availabilaty.